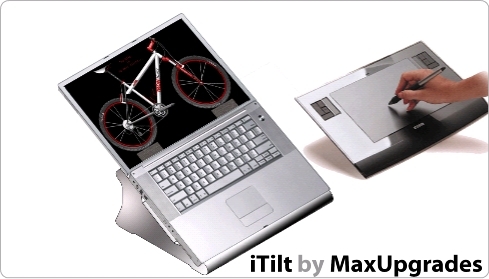 MaxUpgrades iTilt, a notebook positioning stand that incorporate features essential to productively using the notebook and its continuous protection from daily use, from simple internet browsing, to accomplishing most sophisticated task in conjunction with input peripherals like graphics tablet, 3D digitizer and auxiliary monitors, the user will find iTilt an indispensable product. iTilt brings new level of interactivity between user and the notebook, iTilt design makes it possible to position the Notebook Screen to the optimum viewable height, and tilts the notebook keyboard to an angle that enables user to comfortably enter and view information at correct eye level simultaneously for maximum interactive use. 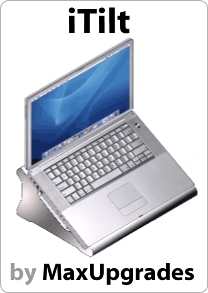 The user can maintain his/her natural upright posture while using the notebook and interact with the notebook without using an auxiliary keyboard. iTilt special rubber compound solid construction isolate notebook from vibration and shock, one of the main cause of notebook failure is the shock and intermittent vibration transmitted to the notebook disk drive and sensitive internal circuitry, vibration and shock transmitted from external source or generated internally and transmitted back to the disk drive and sensitive internal parts. iTilt serve as simple vibration and shock isolator for complete protection of the notebook form shock and vibration while in use or not in use. iTilt front curve design, that runs across the width of the notebook, allows notebook to be seated and gripped for maximum stability. Tilt center groove allows dissipation of heat generated from the notebook and provides space to run cables across the notebook giving user access to the side ports. iTilt back contours uniformly transfers the weight of the Notebook to the bottom rests for the firm grip with the resting surface, that allows the notebook to be balanced so it can be opened for maximum viewing as the user desire, this feature greatly enhances the use of the notebook, when iTilt is used with a graphics tablet, 3D digitizer for demanding CAD, graphic arts and GIS applications.